What makes Patient Opinion different? Australian health services already have many ways to gather patient experiences. For example, many use suggestion boxes, patient surveys, and focus groups. Newer ideas like electronic patient experience "trackers", discovery interviews, and kiosks also work in some areas. Some health services even have a patient feedback or survey facility on their web site. So, what makes Patient Opinion different? On Patient Opinion, everything starts from the patient’s story. So patients, service users and carers can say what is important to them about their experience, in their own way. Unlike surveys, people can start with what they want to say – not necessarily with what the service wants to ask them. Many mechanisms – like surveys – aim to measure the past. Important though that is, it may not provide what is needed to change the future. The stories people tell on Patient Opinion, however, don't just identify what might be done better, they often identify exactly how things should change. The human voice of the story can be a powerful motivator for change, too. Stories really can – and do – change the world. Giving feedback can be a thankless task. Is anyone really listening? On Patient Opinion, people can receive a rapid response to their feedback, so they know their voice has been heard. Recent independent research on Patient Opinion in the UK suggests this increases people's support for the services provided. Research into healthcare complaints indicates that very often people feel giving feedback is "pointless" - they cannot be certain that anything changed as a result. On Patient Opinion, services can show their changes in a clear, visual way, so people can see their feedback really is contributing to change. When Patient Opinion publishes a posting or a response, everyone can see it. That is important - not just because everyone can see the experiences reported by patients, carers and service users, but also because everyone can see the responses. Where feedback is having a real impact on services, everyone can see that it is. A valuable collateral effect of Patient Opinion's transparency is that when someone posts feedback, many different people may make use of it - not just the service provider. For example, in the UK the feedback on Patient Opinion has been used in textbooks, in training health care workers, in local and national research, by local health leaders, by national policymakers, and by patient organisations. The feedback people donate creates a public resource for anyone to use. Giving feedback can be awkward, difficult or time-consuming, whether face to face or online. But Patient Opinion's award winning online platform makes it easy, and even enjoyable. Our user research shows that many people feel better – more empowered – after sharing their story online, and our case studies show staff really appreciate being able to hear what patients are saying in near real-time. Online feedback gives a voice to people you may not yet be hearing from – people with mental health problems, learning disabilities, housebound patients or carers, those with addiction problems, people who are embarrassed or disempowered due to their condition or stigma. Far from excluding people, the web can give more people a voice, and make their voice count. We also realise that not everyone has access to the web or wants to use a computer, and so we also have strategies for Patient Opinion to be accessed by post and phone. Once patient and carer experiences are on Patient Opinion, they can be shared widely across the web at no extra cost. For example, any of the feedback we publish can be accessed in data feeds, and anyone can use our widgets to bring recent feedback onto their own web pages. You can even use a widget to enable people to contribute feedback without leaving your own site. Compared with other approaches to gathering patient and carer experience, Patient Opinion is remarkably inexpensive to use – and much of it is free. The more you use it, the more value you get, and the more value you create for other people at the same time. And using it more doesn't add any extra costs at all. See also this blog: What makes Patient Opinion so different, really? How is Patient Opinion different from Facebook and other social media? Patient Opinion is a secure and safe site that is used solely for the purpose of health service engagement and improvement. Patient Opinion is safe for patients, service users and staff, as all stories are moderated before they are published on Patient Opinion. Patients and service users are de-identified on Patient Opinion. Patients and service users do not require a Facebook account. Patients and service users do not need to access the internet, they can phone Patient Opinion or share their story by completing one of Patient Opinion's feedback leaflets. The Patient Opinion platform is designed for health service improvement and is focused on patient experience: who is listening to them, who is responding, and what changes are being made as a result. Facebook is not specific. Patient Opinion has a search engine that the public can use to explore the experience of patients with particular conditions (e.g. mental health, maternity, diabetes, etc.). Patient Opinion sends an email to nominated staff when a story is posted about their service. Facebook requires constant monitoring. Patient Opinion enables the appropriate people in the health service to respond (e.g. DON, Director of Emergency, CEO), not just those staff in charge of monitoring Facebook. The Patient Opinion platform enables staff to generate reports regarding all patient experience stories they have received. Patient Opinion’s staff work with and support health services in regards to online patient engagement (responding) and encouraging feedback. Health services can get in touch with all patients/services who have posted a story on Patient Opinion, via Patient Opinion (this way anonymity and confidentiality is maintained). If a story is highly critical, Patient Opinion will immediately notify the health service and withhold publication for five days. The health service is encouraged and assisted to provide an appropriate response that will be published simultaneously with the story. Patient Opinion has a rating section after each story posted, so that the health service can also have some quantitative measure of patient experience. 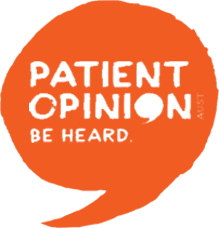 Patient Opinion’s aim is to add to the ‘common good’ of patient experience stories where the Australian public can enter into a dialogue with their health care provider. Patients, service users and staff receive individual log in details allowing them to see how many views their story/response has received, and which staff have read their story. Patient Opinion’s independence ensures that only the patient can remove their story. On Facebook the owner of the page can remove the stories. Patient Opinion’s independence allows at least 96% of stories to be published.